Conversion is your ability to get people to buy things from your online store. The eCommerce industry is awash with reports and predictions for merchants based on what we learned in 2019. Conversion is the process when a customer clicks the ‘buy button’ or every time they sign up to your device. A conversion rate is the percentage of total visitors who buy something on the site. Your conversion rate is more than a measure of your sales. It’s a measure of how well your store is meeting your customers’ needs. 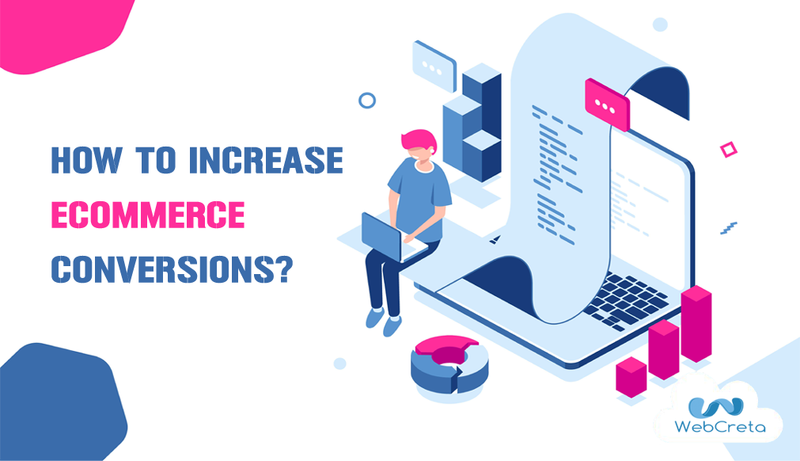 Let’s discuss the strategy to increase eCommerce conversion. The speed of an eCommerce website plays a vital role in its conversion rate. According to one survey, 53% of your customer lose interest, if your site takes longer than two seconds to load. Delay of a single second can result in a 7% reduction in conversions. For e-commerce, a site making $5000 per day. Use Google PageSpeed or even something like Pingdom to figure out your site’s baseline speed. Optimize Images: There are lots of tool available which optimize your images. You have to make sure that because of your images, your site’s performance could not be down. Live chat is one of the best software to offer exceptional customer service to customers by providing fast solutions to their queries. It boosts the conversion rate and increases the revenue of the company. Consumer like live chat option as it is user-friendly and give quick result. Generally, customers get confused with the thousands of products and service you and your rivals offer. So they need valuable and to-the-point answers to their questions. They find it helpful and problem-solving. It improves the conversion rate and ultimately, sales. However, you need to ensure that your customer representative does not keep them waiting for a long time or they will get bored and annoyed and lose interest. Guess how many online shopping carts are abandoned before checking out? So, reminding customers about their shopping cart emails can go a long way in turning an intent to purchase into an actual purchase. According to research done by Econsultancy,”61% of customers read online reviews before making a purchasing decision. Another study by Reevoo states that there is an 18% increase in online sales by showcasing customer reviews on e-commerce website. Smart sellers know that the best way to get reviews is to ask. Send emails to customers and ask for a product rating of an item they’ve bought. You can also provide incentives. Give discounts, coupons or giveaways — in exchange for an honest review. Make sure you give your visitors a chance to leave their reviews on the website. Putting the face of the customer and a review is the best option. First and foremost, offer a guest checkout option. An ideal checkout page lets your users know where they are in the checkout process. It’s your job to get them to check out fast. Simplifying the payment and checkout process is a top priority. It’s your job to get them to check out fast. Simplifying the payment and checkout process is a top priority. To avoid losing potential clients and increase conversion rates, you need a fast and uncomplicated checkout process with a fewer number of steps. You want as few distractions as possible on your checkout page to ensure a seamless process. It’s also a good idea to remind your customers via logos and other visible statements that your checkout process is secure, and that your site meets PCI compliance for securing transactions. With a checkout process optimized in some simple steps, purchasers will feel satisfied and comfortable during the checking out process. As a result, they will become loyal customers of your website and you will see an increase conversion rate. Selling product via blog is one of the best ways to turn your visitors into customers. A blog is a platform where people can share information and experiences with each other. It will be a big surprise at the potential of selling products on your blog. Now, there are a huge number of business blogs that can help your marketing and selling a product or service. Keep in mind the following things when doing a blog posting. The two key factors that guarantee an increase in conversion rate and making a blog successful, are the size of your audience, and how many readers you can convert into customers. There are lots of things to increase the conversion of your site. But you may not know where to begin. Start with something simple like improving your site’s speed before moving on to revamping your copy and visuals. You can create pop-ups, encourage product reviews, enable easy navigation, and a lot more! It definitely takes a lot of hard work. But as long as you know the basics, then you’re on the right track. There are lots of digital marketing company that generate lead generation. Whether you are a digital marketing service provider or just looking to hire a Digital Marketer in Los Angeles, USA or in India, you need to be aware of some basics of lead generation strategy. Follow our advice and you are already heading in the right direction!